Supporting Crisis Management after the Typhoon Yolanda/Haiyan on the Philippines. 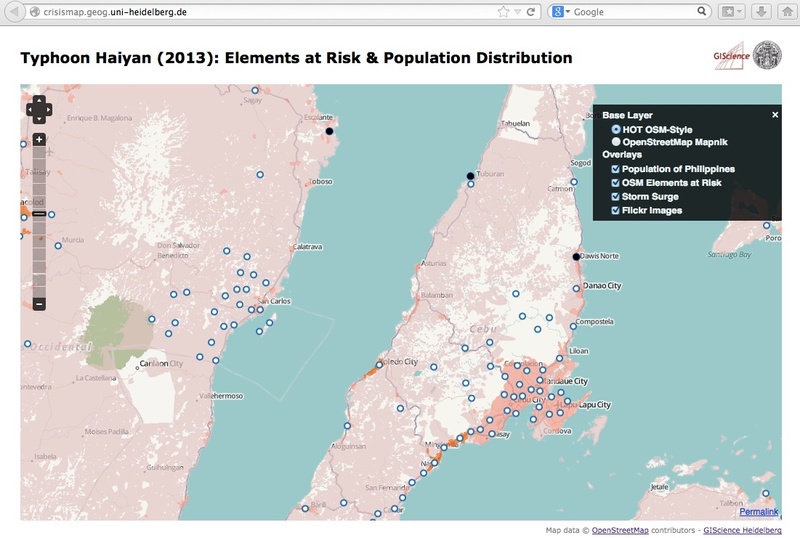 - A new WebSite http://crisismap.geog.uni-heidelberg.de that visualizes new map layers (“Elements at Risk” and “Population Distribution” for the Philipines). Further it adds a currently less populated Flickr layer and a storm surge layer on top of the H.O.T. base map. - A live layer of Instagram images; it’s also available as a WFS/WMS layer here. It’s basically a semi-funny illustration of a ski instructor’s “après-professional” part of a working day. Welcome! – A First Note from Osna. First impression of Osna – just great!! The people are extremely friendly, the volleyball team is great fun and my colleagues at university are very far-sighted and cooperative. I really had a blast of a start up here! How much does the increasing number of PhD degrees advance science? Please choose one of the categories from the menu above!